For more than 5,000 years archery has played a major role in human existence. Today modern equipment is accurate and dependable; it can be primitive or extremely efficient. While firearms may have replaced the importance of the bow and arrow in battle, the popularity of archery is at an all time high. Folk heroes like Robyn Hood, and more recently characters like Katniss Everdeen have popularized and reignited an interest in archery. It can give us a chance to relive our beginnings, to celebrate our exploits, and to meet our personal challenges. It's a fun family sport that can be enjoyed by individuals or groups. It can be a fun filled pastime, or a can be a very intense sport. It can develop fitness and strength to provide food. It's for men, women, children, the disabled -- no one is excluded. 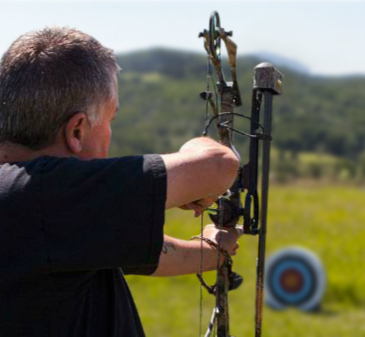 Archery offers several genres including games, hunting, the Olympics, or just plain passing time. Our goal with this program is to introduce you to the sport of mankind since time began. Through this program we hope to help open a door for you into a new and wonderful world -- of archery.